The unemployment rate remains below 4%, but the low figure leaves many Americans unimpressed. In fact, it hasn’t even registered with many. Fewer than four in ten know that the jobless rate is below 5%. 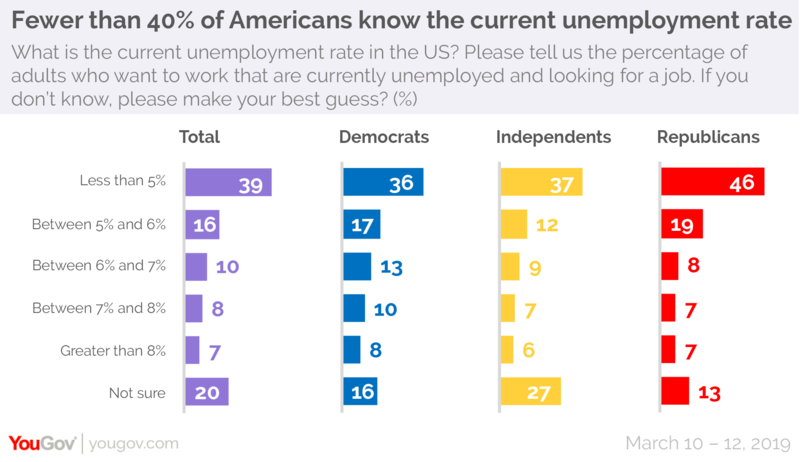 More Republicans than Democrats know this, reversing the trend seen during the Obama Administration, when Democrats were more likely than Republicans to recognize joblessness decreasing. Nearly as many Americans believe the economy is getting worse (25%) as say it is improving (28%). Typically, these sentiments are subject to politics and to short term news events. Democrats are more negative than Republicans when rating the economy now (just as Republicans were more negative when Democrats held the Presidency). And during the recent government shutdown, Americans were more likely to think the economy was getting worse. Now, even with low unemployment, nearly half describe unemployment as a serious national problem. 37% say it is a serious problem in their own areas. Only one in four know that it dropped from last month’s figure. 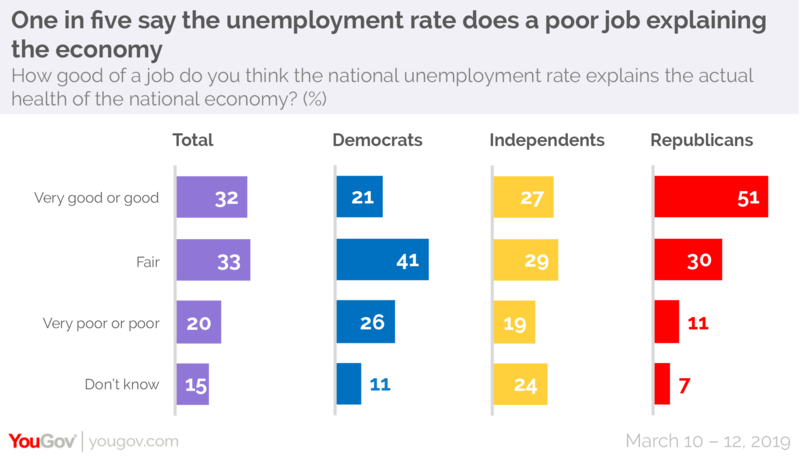 When it comes to whether or not Americans think the national unemployment rate actually explains the health of the national economy, one in five (20%) thinks it serves as a poor indicator. At present, Republicans are much more likely to believe the low rate of unemployment as indicative of the health of the economy. In the summer of 2016, when the jobless rate was slightly higher than it is today, but clearly declining, 31% of Democrats called the unemployment rate a good indicator of the state of the economy compared to just 14% of Republicans. But there are other competing concerns. 30% consider the jobless rate as the best economic indicator, but nearly as many regard the prices of good and services that way. 17% say their own personal finances is the best indicator of the condition of the economy, and 9% claim it is the stock market. 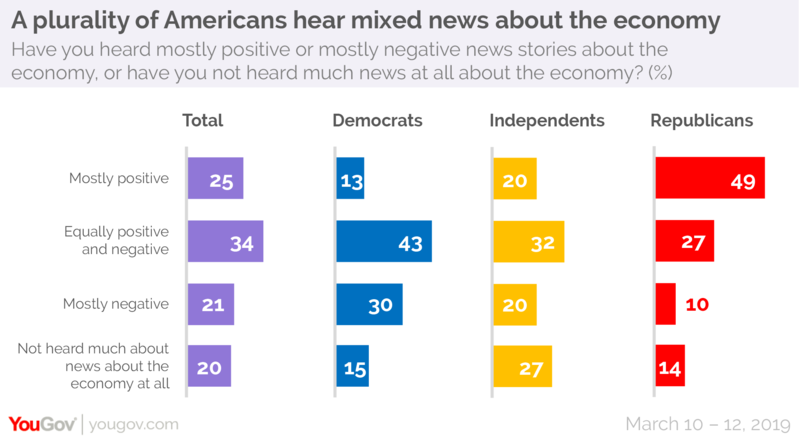 Another limit to the spread of economic news may be due to what people hear in the media: only one in four Americans say they are hearing mostly positive news about the economy. More say the news is mixed (34%) or even mostly negative (21%). Half of Republicans, however, say they hear mostly positive news. Despite limits on the communication of good economic news, the economy remains President Trump’s best issue area. By 48% to 39%, the public approves of how he is handling it. That’s far better than his overall approval rating, which stands at 42% approve and 50% disapprove. 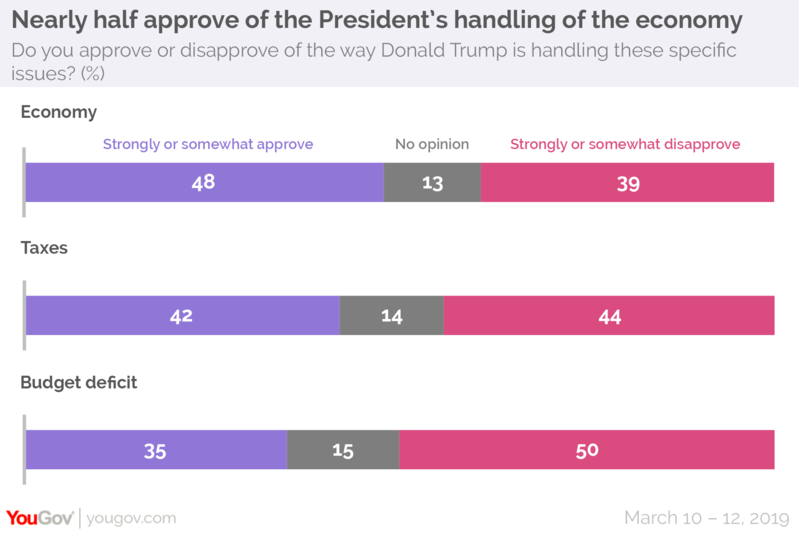 There are also economic weaknesses for the President. Americans are divided in their approval his performance on tax reform. Nearly as many people who have filed their taxes say they paid more (23%) under the new plan as say they paid less (25%). 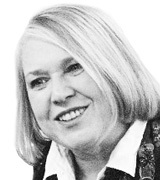 A quarter (25%) of those who have yet to file expect they will pay more. So opinion about the President’s handling of that issue is mixed. And approval of his handling of the budget deficit is lower than his overall approval. One in five Republicans disapprove of how the President is handling the budget deficit.